From unique shapes to a variety of bold colors and textures, we've rounded up the best in Casual Dinnerware. Get inspired by these table designs for your registry! Showcasing the unique glaze reaction only Denby can achieve, this pattern features a stunning aquamarine and white glaze creating a beautiful speckled finish. A beautiful, textural glaze with the iconic chevron pattern creates a striking contrast when mixed with Denby’s Natural Canvas, or is stunning enough to stand alone. Designed with laid-back dining and entertaining in mind, Studio Blue features a range of bowls, plates and platters in four tonal glazes inspired by colors found in stone and minerals. Art deco styling and truly an American icon. Available in over 85 items and 14 vivid colors. Lead free, microwave, oven and dishwasher safe. Each piece carries a five-year chip-replacement warranty. Sustainably made in West Virginia, U.S.A.
Fiesta coordinates everything for entertaining— from striking textiles to entertainment sets, platters, bowls, and beverage servers, to Tervis insulated tumblers and stainless flatware—and now introduces fruit/salsa bowls to the mix. This stoneware is defined by its modern graphics and tonal color palette, setting the scene for any meal. Dishwasher and microwave safe. 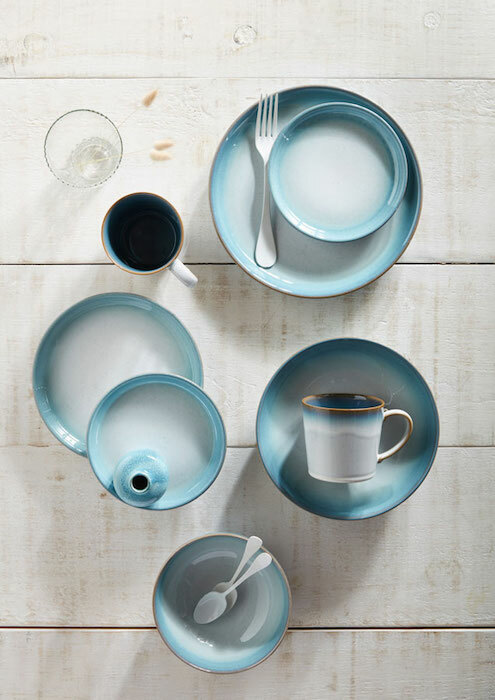 This glazed stoneware collection is defined by its pretty, eyelet-inspired detail and sets the scene for any meal. Available in gray, blue and cream. Microwave and dishwasher safe. This porcelain dinnerware, in a beautiful watercolor in cool grays with accents of coral and plum is available in a mix of rim and coupe shapes A surprise botanical pattern on the back rim of the dinner plate makes this pattern extra special. Microwave and dishwasher safe. A Bloomingdale’s exclusive. This porcelain collection is available in four colors and showcases a glossy pebble texture against a bright white glazed interior. Dishwasher and microwave safe. Organic motifs subtlety interpreted as a tone on-tone surface decoration in black, white, gray, navy, and red. Available in place settings as well as extensive accessories to mix and match in your own curated dinnerware collection. Each piece on white porcelain boasts bold lines and three seamlessly coordinated glazes in a subtle, elegant color palette. Available in two shapes, coupe and stax. A contemporary collection on fine stoneware, popular for 20 years. Available in a coupe, rim, square, or curve shape, with matte color on the outside contrasting with the glossy cream inside glaze. Sixteen stylish colors, with numerous accessories and serving pieces. The Hammock Collection epitomizes a casual style and is made to fit a modern life. The motifs of dots, lines, checks, and a solid texture reminiscent of faded denim, allows the creativity to mix and match for a customized table. Exclusively at Macy’s.